20-06-2018- GSTR-3B for the Month of May 2018 Pay due Tax till this date. (Earlier it was required to be filed before GSTR-1 & but now from May 18 onwards GSTR-1 is to filed first so data needs to be finalized before 10th itself). 30-06-2018 Due date of – Tran – 2. Registered persons under GST but unregistered under old regime. A dealer or trader who does not have documents of duty paid in previous regime. Last Chance to claim Input tax Credit on Stock of 30.06.2017 for those who have filed TRANS-. 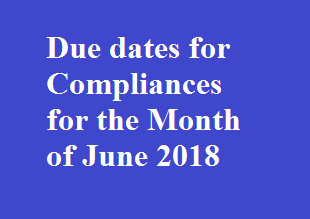 29-06-2018 – Due date for e-filing of a statement (in Form No. 3CEK) by an eligible investment fund under section 9A in financial year 17-18.